Baltimore Gas and Electric Company this week announced Fountain Green Elementary School as the winner of “The Adventures of Captain Mercaptan,” BGE’s Natural Gas Safety Hero Challenge. The annual contest challenges public and private elementary school students at schools in BGE’s service area to illustrate gas safety messages featuring Captain Mercaptan, BGE’s fictional natural gas safety superhero, for a chance to win up to $10,000 towards a school enrichment project. Overall, $35,000 is being awarded by BGE to winning schools and $140,000 has been awarded to winning schools since the contest’s inception. The first-place comic strip will be featured in a BGE natural gas safety advertisement in the spring. Captain Mercaptan teaches kids how to recognize a natural gas leak and what steps to take when they smell gas. 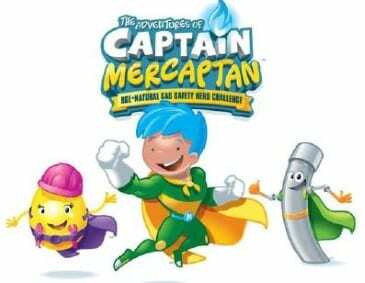 Captain Mercaptan’s name is derived from “mercaptan,” an additive to natural gas used by BGE and other utilities to give it a distinctive rotten egg odor that makes gas easier to detect. The superhero and his safety sidekicks, Sunny and Piper, were designed by elementary school students during BGE’s first “The Adventures of Captain Mercaptan” contest. Use your nose. Mercaptan is an odor that BGE adds to natural gas to give it a rotten egg smell. Use your ears. Listen for the hissing sound of escaping gas. Use your eyes. Look for dirt being blown into the air, dead plants or grass in otherwise green areas, fire coming from the ground or water bubbling and being blown into the air. If you detect natural gas, leave immediately. Don’t attempt to detect the source of the leak. Don’t use matches or turn anything on (including a cell phone). Find a safe place outside and call BGE or have an adult call 1.800.685.0123.